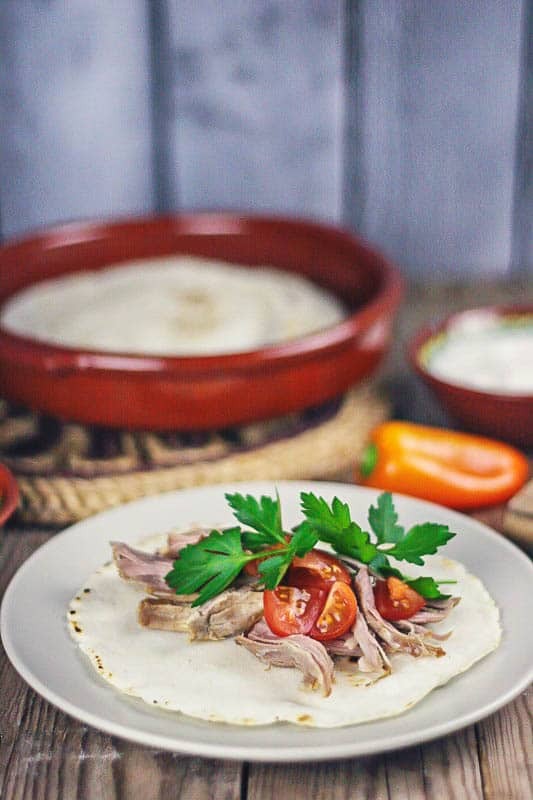 Slow Cooker Pork Carnitas with Homemade Corn Tortillas (& Paleo Version) - Oh, The Things We'll Make! Crispy on the outside, yet moist and flavorful, these slow cooker pork carnitas are so easy to make that you'll have plenty of time leftover for making some homemade corn tortillas. For a fully paleo dish, they are also excellent served with my paleo flaxseed tortillas. My original slow cooker pork carnitas with homemade corn tortillas were served straight from the slow cooker to keep the pork moist. I have been experimenting with a lot of new foods lately, not just because of the blog, but because I love trying new things. It also helps that I finally found a slow cooker here; they aren't exactly commonplace here in Spain. 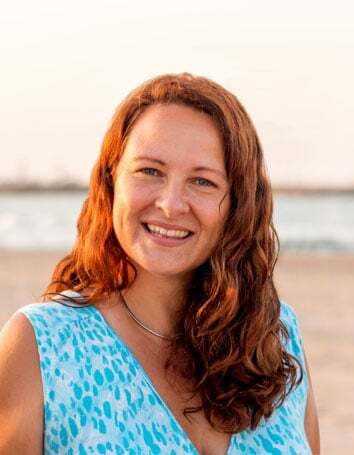 One of the most important reasons for experimenting with new foods, though, is that I am looking for healthy new foods that my son will want to eat. One of my new favorite go to recipes is for these slow cooker pork carnitas. 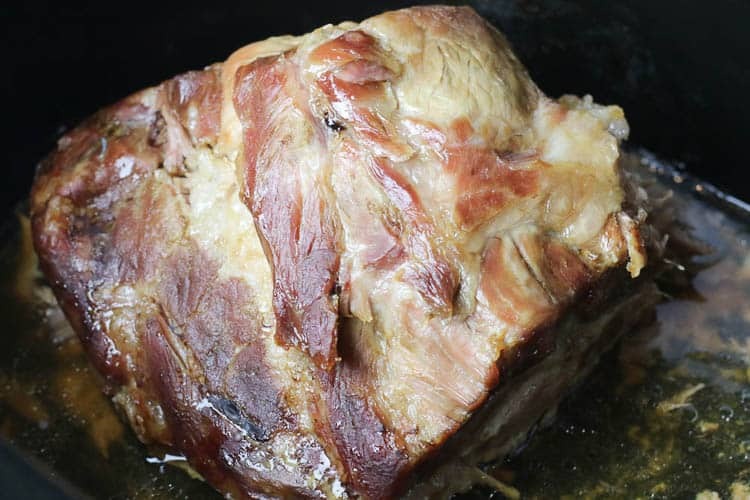 I had already been slow roasting pork shoulder ever since I bought my slow cooker, but it was mostly with barbecue sauce because my husband preferred it that way. Honestly, though, I'm not a huge fan of barbecue sauce. Plus, I have been trying to cut out processed foods, and barbecue sauce usually has a lot of sugar in it. Yes, I could and occasionally do make my own barbecue sauce, but it's not exactly a quick and easy process that I want to be doing on a daily basis. I could just serve the slow roasted pork by itself, but my husband didn't really like it that way. Looking to change things up made me think of years ago when my husband went to the US with me so that I could finish up dental school. He worked at a Mexican restaurant there, and we got to know a family from Mexico that was working with him. We used to get together with them outside of work, and they, at home, would make a slow roasted pork and serve it in homemade tortillas; I loved it. Looking online for what to call it, I happened to come across several recipes that seemed to fit the description, and learned that most people referred to them as carnitas, but everybody seemed to make them in a different way. I have since been experimenting, and think I have finally found my favorite way of making slow cooker pork carnitas. The first time I tried making carnitas in my slow cooker, I slow cooked the pork shoulder with some onions and different spices. Once they were tender, I shredded the pork into relatively big pieces, and re-fried the meat in some lard right before serving it. Most carnitas recipes did some variation of that process. The problem was that I found the meat tasty, but slightly dry and fatty at the same time. After further experimentation, I decided I preferred just slow cooking the pork with a little salt, sometimes with a few spices like cumin and cayenne, and then shredding it right before serving it without refrying it. For awhile I loved it like that, and I even shared it that way on my blog. I found the pork moist and flavorful, but my husband eventually admitted to me that he thought it tasted like boiled meat, and didn't really love it that way. Place pork shoulder in your slow cooker with the garlic, cumin, salt, black pepper, and cayenne pepper, and cook on low for 6-7 hours. At this point, smash the cooked garlic cloves to blend them into the juices that have been released by the pork. Peel and slice the onions and add them to the slow cooker, along with the juice of 1 lime. I like to add the onions when there is only an hour or two left in the cooking process so that they don't burn or become so well cooked that they lose all consistency. With an hour or two cooking time they caramelize perfectly without disappearing. That said, if you will be away from home, you can add all ingredients together at once from the beginning. After 8 hours, the pork should be tender. You can now remove it from the slow cooker and serve it as is, or proceed to make a crispier carnita by frying them in a cast iron skillet in some lard (our new favorite way of doing it). Heat a cast iron skillet to high heat and melt in some lard while you are lightly shredding the cooked pork. Brown the shredded pork in the lard. If you like it really crispy, you can use high heat, and flip the carnitas to brown the other side too. Just try not to cook them for too long so that the meat doesn't dry out. 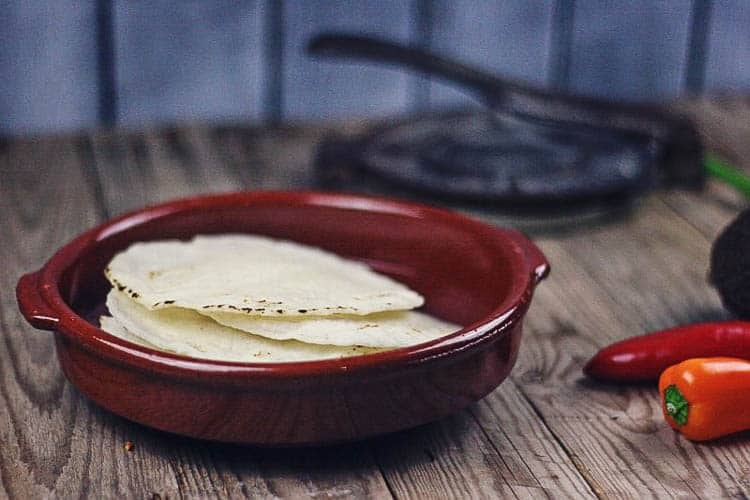 Serve with the caramelized onions on homemade tortillas with the toppings of your choice. Serving the carnitas is simple. Add some shredded pork to one of the tortillas, along with the caramelized onions and whatever condiments and toppings you prefer. Cilantro is traditional, but neither my husband nor I are huge fans of cilantro so we don't usually add it. Squirting some lime juice over top of the meat is also good. I like to just add lettuce, some avocado, and maybe a bit of sour cream (homemade kefir sour cream is especially tasty! ), but my husband usually adds salsa and diced tomatoes. My son does a pretty good job of holding the wrapped up tortillas and eating them himself! It's wonderful finding something that everybody in the house eats well. 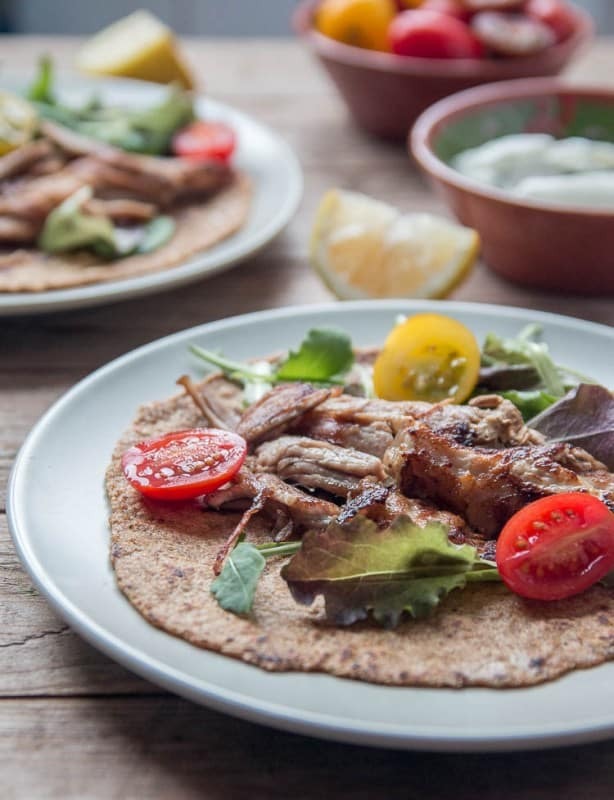 Since the slow cooker does all of the work of making the pork taste amazing, you have extra time to be making the homemade tortillas which makes it all worthwhile. Now I usually make them like this: crispy on the outside and served on a paleo flaxseed tortilla. [Update] I have become quite a bit more “paleo-ish” since I first wrote this recipe, so I rarely (if ever) make corn tortillas anymore. Instead, I usually serve these in either my homemade vegan flaxseed paleo tortillas, or my low carb paleo tortillas with flaxseed and eggs. 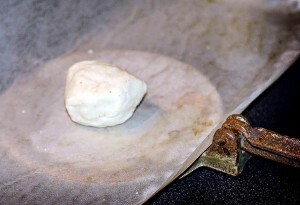 In any case, for those who want to make corn tortillas, I will leave you with my methods for making them. If you have leftovers that have been stored in the fridge and you want to serve them as crispy carnitas, you should warm the pork slightly before trying to pan fry them in lard. I usually only fry up small amounts at a time, and leave the main roast of meat together in one piece. The pork stay moist in the center that way, especially if you have to put it in the fridge for another day. If you shred and try to fry the pork while cold, it will warm up for you and will still taste great, but it's much harder to get it crispy on the outside. As for the tortillas, we decided after trying the pork with store bought tortillas, that we preferred the combination of pork with corn tortillas rather than flour ones; most carnitas are served with corn tortillas, so I guess that makes sense. Since I have been toying with the idea of trying to eliminate gluen from my diet for awhile, the corn tortillas also have the advantage of being gluten free. Having (crazily) brought my (heavy) tortilla press with me here to Spain, I had been meaning to try making some tortillas of my own. So I bought some masa harina and had at it. The problem? For some reason I thought the masa harina that I had been using was GMO free. Unfortunately, I found out it's not, and it is impossible to find a non-GMO version here in Spain. In the US, I have read that this one is GMO free, so if you are in the US, I'd love to hear about trials using that. I'm a bit jealous since I can't find any myself. Since then I have been making my homemade corn tortillas with an organic corn flour instead. They aren't as easy to manipulate as the ones made with masa harina, and don't turn out quite as pretty as the ones I showed you in my post, but it isn't impossible. The package of masa harina that I bought had instructions for making tortillas on the package; they instructed you to mix it with a certain amount of water. Once the water is absorbed, you're supposed to roll the mix into balls which you press into a tortilla shape in your tortilla press. You then fry them in a skillet, preferably a cast iron skillet if possible. I now do the same thing with the organic corn flour, but the process is slightly trickier because the dough is a lot more delicate and falls apart more easily. 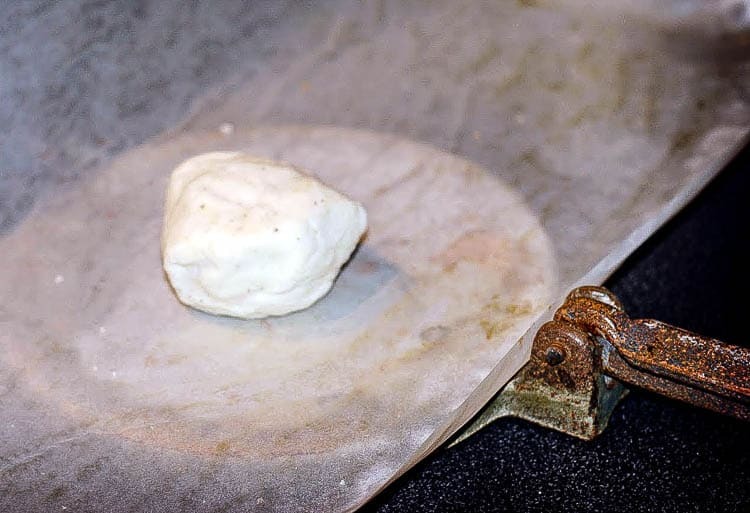 To keep them from breaking, I peel off one layer of the paper that was lining the tortilla press when I flattened out the dough, and place the tortilla on my skillet with the other layer of paper still attached (paper side up, of course!). As the tortilla starts to cook, I can easily peel off the top layer of paper without it breaking, right before flipping the tortilla. Once it has been slightly cooked, it holds together much better. The first time I made them I tried frying them in a little bit of home rendered lard. They turned out well, but they were a bit thick and a bit greasy. The next time I made them, I added the home-rendered lard right into the mix itself with a dash of salt. I also added more water so that the mix was softer and more easily pressed into a thinner tortilla. Making them that way, I didn't need to fry them in any fat; they didn't stick and cooked perfectly. I cooked until I got brown spots on one side, flipped, and did the same for the other side. They turned out wonderfully, so much better than the store bought counterparts. Since then I go back and forth with my method for making them. Either way works out well, so choose the method you find easiest. I think the issue that I had on my first trial was more about a lack of water in the mix rather than where I added the lard. 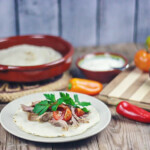 Regardless of the method you use and the tortillas you choose to serve them on, I hope you've seen that this recipe is highly adaptable to each person's taste. I like to keep the amount of salt and cayenne pepper low to allow for people to add more salt, black pepper, and cayenne pepper later on. If you find any other great tricks for making perfect slow cooker pork carnitas, I'd love to hear your comments! Your tortillas look wonderful! I make mine with masa harina and I’m 99% sure it’s GMO. I am curious your recipe using the corn flour, I thought the tortilla needed the lime-treated corn? Anyways my tortillas are tasty but non-pliable, they crack and break if you try to fold them. I also never get nice crown spots like yours, I usually cook them on the griddle without any fat. I’ll try it in the skillet & see if that helps. I had always read that you needed the lime-treated corn, too. I was even about to try to buy lime and try to make my own!! In the end, though, I had bought some organic corn flour and figured why not just try to use it and see what happens. It was definitely harder to work than the masa harina, but when I placed it on the skillet with the paper still attached, it was workable. I have them turn out very pliable sometimes, and not so pliable others. I think it depends a lot upon the amount of water & fat in the mix, and also the temperature you use to fry them. I think they turn out better when the temperature is pretty high and you flip them quickly (I think that also helps with the spots). The longer they sit on the stove, the drier and less pliable they get.